Last week, while headed to a conference on food security in China, I experienced one of those moments that are so powerful to those of us involved in reducing food waste — and that in my case seem to occur with increasing frequency. With an hour to kill before my flight, I went to one of the airport restaurants to get something to eat. 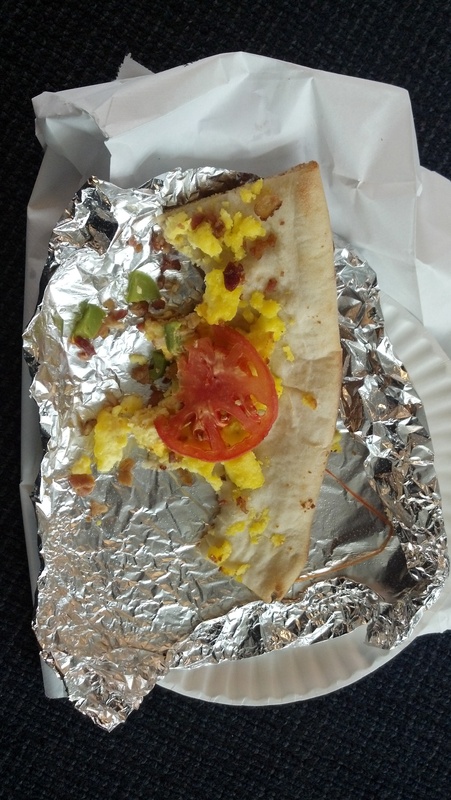 I was pleased to find a good looking pizza location, and even more pleased to find that they offered breakfast pizzas – a typical pizza crust covered with bacon, scrambled eggs, sausage, etc. Since it was 11 AM and I hadn’t yet had breakfast, it was a perfect option prior to the long flight. I paid for my order and waited while it was placed in the oven to heat up. Yet immediately after my slice was put in the oven, I noticed that the staff began to pull all of the breakfast pizzas (and breakfast strombolis) from the display area and load them on a cart behind the counter. That action didn’t immediately register with me until, literally within one minute of receiving my slice, another customer came to the counter and asked if he could still get some of the breakfast pizzas (which were still visible). The response from the employee behind the counter? “No, it’s too late. They’re too old.” This of course piqued my interest because I hadn’t even taken my slice off the counter yet (although that one was deemed to still be good enough to sell! ), so I asked if they were going to donate the slices and strombolis that were headed toward the back of the restaurant. “No, she replied, “we don’t do that.” Unfortunately, it was the answer that I expected. This situation is all too typical of what we see in food courts and restaurants – little effort (in, fact, little thought) to doing something other than discarding perfectly good food that has reached some arbitrary time cut-off for sale under the guise of maintaining high quality standards. In this case, the other customer would have been happy to pay for one of those slices – it’s really what he wanted at the time – yet he ended up being forced to choose an alternative item despite his clear preference. He walked away, resulting in a lost sale for the restaurant. Second, the first customer, me, was left to question why something that had just been deemed unsaleable for one customer was somehow of fine quality for me despite the fact that it had been ordered only about one minute before the dreaded changeover point. To drive home the point, I cynically pointed to my slice and asked why this piece was good enough for me if the other slices weren’t deemed acceptable for the other individual at the counter. This led to a flurry of offers to replace my pizza with another variety (traditional red-sauce pizzas) that were quickly being set out for display and sale for the afternoon lunch period (and I mean a flurry). I explained that I was trying to drive home the point about the silliness of the arbitrary time cut-off as well as the strong potential for donation of this food, but I wasn’t successful at all in changing the thinking of anyone behind the counter. This robotic adherence to sell-by cut-offs in stores leads to a tremendous amount of wasted food in developed countries (think rotisserie chickens and pre-made sandwiches) and is supported by the fact that it is simply too easy (and too cheap) to discard excess food. The “when in doubt, throw it out” concept prevails. It’s ironic that these time cut-offs, which were developed in order to ensure customer satisfaction through consistent delivery of high-quality food, can have the opposite impact. In this case, the store lost a sale, and two customers were left dissatisfied by a policy that was designed to have the very opposite effect that it did. What’s stunning to me is the unwillingness of store personnel to adapt to customer preferences on the fly in these situations. Wouldn’t it have been much better to provide the second customer in this case with the food item that he really wanted? Thinking even further out of the box, the employee could have given the item to the customer for free, or at a reduced price. Further, the daily process of discarding perfectly good food should trigger a thought that the restaurant could achieve additional positives – helping food insecure people, helping the environment, and reducing disposal costs – by donating that food rather than discarding it. Consumers can help drive this change by speaking up when they notice perfectly good food being discarded at cut-off times. Employees could do the same. Regrettably, we tend to default to the traditional – and easy — approach of throwing it in the trash. It’s time for a change at changeover time. We can all help to reduce the many costs of food waste by getting more active and speaking up when we notice perfectly good food that that is being carted away to the dumpster. Help prompt a culture in which organizations embrace sustainability and empower employees to take steps to act responsibly to reduce food waste.